Very good start to the EPL fantasy season, but like Tiger leaving a couple strokes on the board in yesterday’s PGA Championship, a couple late lineup decisions kept us from being first. Since fantasy football isn’t starting for us in a couple weeks, we’ll be focusing on our EPL fantasy futból team for now. Check out our post from last week to see the main differences between fantasy football and fantasy futból. Our main EPL fantasy league is a $50, 8-team, winner take all league with total scoring. Thus, whoever scores the most points over the course of a season wins. In our main league, we are determining the winner based on who finishes 1st in the first session (first half of the season), with another $50 follow-up for the second session. After Week 1, our EPL fantasy futból team scored 70 points, good for 2nd place in our main league. We’re also in a separate head-to-head league and won that matchup. 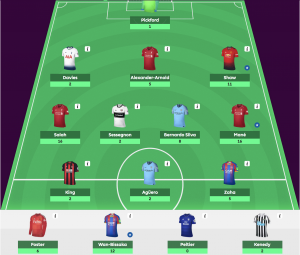 For context, to make it in the top 1% of all EPL fantasy futból teams last year, you’d need to average around 55-60 points for each game week. However, two late swaps prevented us from being first. The first was swapping out Richarlison for Sessegnon in MID, and swapping out Mendy for Davies in DEF. Those two decisions cost us 25 points. Oh well. Until next week. In other news, our fantasy football team drafts 2nd in our 12-team, one keeper league. Stay tuned for updates on who every team in this league will keep before our draft in two weeks. This entry was posted in Company News, StakeHaul Challenges. Bookmark the permalink.